An online bachelor’s in general studies program offers a flexible plan of study that allows you to incorporate a variety of topics into a single degree. As more occupations demand diverse skill sets, a broad knowledge in areas such as research, technology, and liberal studies is becoming increasingly valuable. Your individualized curriculum can lead to employment within industries ranging from banks and colleges to manufacturing and social services. University of Missouri ranks #1 on The 45 Best Online Bachelor's in General Studies Programs! The University of Missouri, or Mizzou, opened in 1839 as a public university on land from the Louisiana Purchase. Out of the total number of bachelor's degrees awarded by Missouri public universities, 27% of them are granted by Mizzou. The school offers 300 programs to over 30,000 learners from more than 100 nations. Eighty-nine of those programs are available online, including the bachelor of general studies. This online general studies degree requires 120 credits, 45 of which must go toward the major. The major includes three areas of study, and 15 credits must be devoted to each area. The university also requires "depth of study" courses in at least two of four areas: behavioral sciences, social sciences, humanities and fine arts, and physical sciences. Students round out their general studies degree with a capstone course. While the department delivers courses in eight-week and 16-week formats, degree seekers can enroll in self-paced classes and dedicate as much as six months to a single course. Students enrolled in this general studies program online improve on skills essential for employment, including communication, initiative, and writing ability. The program is best suited for transfer students, who need at least 24 college-level credits and a 2.5 GPA to be admitted Students should also note that no course with a grade lower than a "C-" counts toward graduation. Financial aid is available, and veterans as well as community college graduates may qualify for a 10% tuition discount. The University of Missouri receives regional accreditation from the Higher Learning Commission. University of North Dakota ranks #2 on The 45 Best Online Bachelor's in General Studies Programs! Providing students with more than 200 degree options, the University of North Dakota attracts learners from 80 nations. The school opened in 1883 -- years before North Dakota became a state. Though the institution's original group of graduates included fewer than 10 people, the school currently educates almost 15,000 learners. Students wanting to earn a general studies degree online can pursue the university's bachelor of general studies. To graduate from the program, students complete 125 credits from general requirements on top of a student-specific curriculum approved by the College of Arts and Sciences. Fields represented in the program include fine arts, natural sciences, humanities, mathematics, and social sciences, though the student's individual curriculum could cover a variety of subjects. It takes four years of full-time study to complete the degree, and students can expect to graduate with abilities in writing, speaking, decision making, and cultural understanding. Learners can enroll in classes during the standard academic year or choose what the university calls "enroll anytime" courses. With these classes, degree candidates can take as many as nine months to complete coursework online or through the mail, but are not eligible for financial aid. Admitted students can enroll in both types of classes concurrently. For admission, freshmen applying for the spring, summer, or fall semesters should have less than 24 credits worth of previous college coursework. Transfer students, however, should have at least 24 credits. The university awards qualifying freshmen with scholarships based on GPA/GED results and ACT/SAT scores. The University of North Dakota is regionally accredited by the Higher Learning Commission of the North Central Association of Colleges and Schools. Indiana Wesleyan University ranks #3 on The 45 Best Online Bachelor's in General Studies Programs! Indiana Wesleyan University was founded in 1920 based on principles of the Wesleyan Church. The school boasts over 80,000 graduates and offers more than 100 degrees. One of the institution's programs is an online general studies degree, the bachelor of science in general studies. The degree consists of 120 credits, including a 20-credit concentration from the following options: business, communications, computer information technology, criminal justice, entrepreneurship, fine arts, history, human services, liberal arts, life sciences, marketing, mathematics, and religious studies. Learners must take at least nine concentration hours at IWU. Thirty credits consist of core subjects such as biblical studies, written communication, and mathematics. An introductory seminar and a general studies colloquium are also required. Degree candidates can complete the bachelor's in less than two years and must maintain at least a 2.0 overall GPA and a 2.25 GPA for core classes. The start dates for the program are in April, May, and June. Transfer students can earn up to 40 credits based on a review of prior coursework. IWU provides financial assistance, such as tuition discounts for military personnel and the William A. Crawford Minority Teacher Scholarship. Outside financial aid may come from grants, loans, and scholarships, but learners must report these scholarships to the university. Online learners also gain entrance to the school's virtual library. This tool offers students access to books, articles, videos, and websites for research, as well as information on APA format and plagiarism. Indiana Wesleyan University is regionally accredited by the Higher Learning Commission. Drexel University ranks #4 on The 45 Best Online Bachelor's in General Studies Programs! What began as a nondegree school in 1981 -- the Drexel Institute of Art, Science and Industry -- evolved into Drexel University. This private school in Philadelphia, Pennsylvania educates more than 24,000 learners using the latest technological advancements in education. For instance, Drexel provided students with a wireless learning environment in 2000 and a web portal in 2002. Among the school's 200-plus programs is the online general studies degree. This bachelor's requires 180 quarter hours, which amounts to 120 standard credits. For subjects like English, speech, mathematics, and computing essentials, required courses include techniques of speaking and computer applications for professionals. Other required classes include lifelong learning and theory, as well as a senior project. Forty-five quarter credits must come from the student's concentration. These concentration classes are based on a student-specific, advisor-endorsed plan. Degree candidates for this online general studies bachelor's degree should also complete electives from the natural sciences, liberal arts, and an open category. At least 36 credits of electives and concentration courses must come from upper-division classes. Additionally, learners may choose a bachelor of science in general studies with a minor in business. For admission, transfer applicants should hold at least 24 credits and a 2.5 GPA. The department accepts applicants with fewer than 24 credits if those students finished high school in the last two years. Students with no college-level credit must also submit SAT or ACT scores. Certain groups of degree seekers qualify for tuition discounts, such as military personnel and alumni. Ball State University ranks #5 on The 45 Best Online Bachelor's in General Studies Programs! Based in Muncie, Indiana, Ball State University started in 1918 and currently educates over 20,000 students through 300-plus undergraduate, preprofessional, and graduate programs. The school received Community Engagement Classification from the Carnegie Foundation for the Advancement of Teaching and has earned Innovator Awards from Campus Technology. The school offers a 120-credit online general studies bachelor's degree that requires two minors from options such as applied behavior analysis, business information technology, residential property management, and sociology. The department delivers courses asynchronously. Students complete the core curriculum in tiers. The foundation requirements are general education courses, and the next tier -- domain requirements -- cover a variety of classes in the humanities, social sciences, natural sciences, and fine arts. The third tier is the capstone course, which is required for graduation. Additionally, students need to complete a writing competency exam and a writing emphasis course in one of three areas: music basics for the classroom, human behavior and the social environment, or foundations of Asian civilization. Learners also take the writing proficiency exam near the midpoint of the program, between 60 and 90 credits. To lower the number of needed courses, students may take exams from the department or the College Level Examination Program. With approval, transfer credits can be used to claim a minor, and military experience qualifies for credit. Ball State University is regionally accredited by the Higher Learning Commission. Liberty University ranks #6 on The 45 Best Online Bachelor's in General Studies Programs! Liberty University in Lynchburg, Virginia educates over 100,000 students from over 85 nations in more than 500 fields. This Christian institution began in 1971 as Lynchburg Baptist College through a community pastor's encouragement. Since then, the school has become one of the largest private universities in the United States. For the university's 120-hour bachelor of science in interdisciplinary studies, learners must take 39-42 credits worth of core classes and devote 45 credits to two or three areas of study. General education requirements cover areas like communication and critical thinking, but many of those requirements can be fulfilled by electives. Available areas of focus include aviation sciences, education, health sciences, language studies, paralegal studies, and sports management. Learners earning a general studies degree online at LU must complete electives from three categories: information literacy, social science, and composition. The department requires only six courses by name, including instructional technology for online learning and introduction to theology. To graduate with this online general studies bachelor's degree, candidates must earn at least 30 upper-division credits, maintain a GPA of 2.0 or higher, submit a graduation application, and complete a minimum of 30 hours at LU. LU offers advantages for military personnel such as tuition discounts, book vouchers, and college credit for military experience. Nonmilitary students may also qualify for financial aid, including the World Life Scholarship and the Central Virginia Community College Scholarship. University of Nebraska Omaha ranks #7 on The 45 Best Online Bachelor's in General Studies Programs! From its main campus in Omaha, the University of Nebraska educates more than 15,000 learners, over 10,000 of which are enrolled as full-time students. The school has earned praise for its educational and community achievements through organizations like the Carnegie Foundation, and offers approximately 450 fields of study. The school's bachelor of multidisciplinary studies consists of 120 credits and -- beyond general requirements and electives -- requires three focus areas from fields such as library science, cybersecurity, management information systems, fire service management, geography, and nonprofit administration. The hours needed for these focus areas vary depending on whether a student declares a concentration. Degree candidates with a concentration must fulfill 30 hours in the concentration field and earn at least a "C" in each class. Students without a concentration must complete 15 credits in each focus area. All degree candidates must complete 40 credits of general requirements that include English, humanities, and science courses. Students must also complete electives: 26 hours for a concentration route and 35 hours without a concentration. As graduation approaches, graduates can take advantage of the university's career development center to identify job opportunities. This resource assists learners with resumes, cover letters, and interviews. Online courses are taught using the Canvas learning platform. Financial assistance is available from the university, including eight UNO Women's Club Scholarships for exceptional students. The UNO Advantage Scholarship assists out-of-state degree candidates by cutting tuition to the in-state rate. The University of Nebraska is regionally accredited by the Higher Learning Commission. Texas Tech University ranks #8 on The 45 Best Online Bachelor's in General Studies Programs! In 1925, Texas Technological College opened with an enrollment of just over 900 students. The institution became Texas Tech University in 1969, and today, the school educates over 30,000 learners in over 200 programs, and also boasts over 400 student organizations. For students interested in an interdisciplinary education, the college offers an online bachelor of general studies. This degree calls for 120 credits that include three areas of emphasis, each consisting of 18 credits. The university recognizes two or more of the focus areas as minors, and two of the fields need to come from the College of Arts and Sciences. The university expects students to submit a degree plan for approval after reaching 45 credits. Texas Tech requires degree candidates to complete classes such as essentials of college rhetoric, history of the United States since 1877, and American public policy. Additionally, learners must fulfill a number of electives in areas such as oral communication and the creative arts. The department requires learners to study a minimum of one foreign language, although high school courses can fulfill this requirement. Nine credits must be completed in residence at Texas Tech, meaning the program is not fully online. Twenty-four credits must be upper-division courses in the three focus areas. The university also expects a minimum 2.0 GPA for admission and graduation. 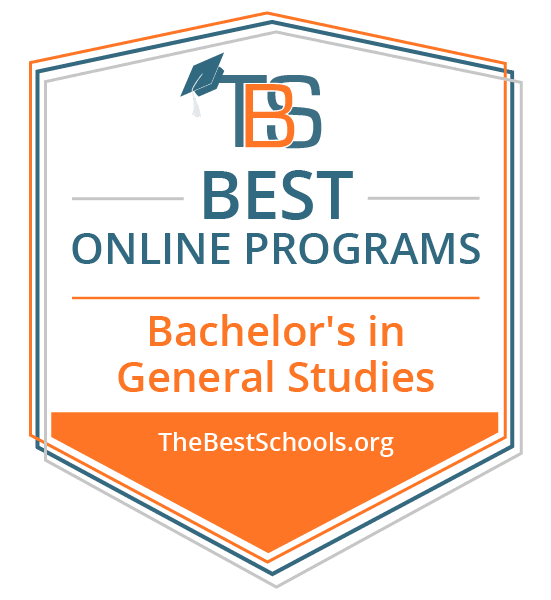 Georgia Southern University ranks #9 on The 45 Best Online Bachelor's in General Studies Programs! Georgia Southern University began as the First District Agricultural and Mechanical School in 1908, enrolling only 15 students. Today, over 20,000 learners from approximately 100 nations attend the Statesboro institution to study subjects in over 140 programs. For the 126-credit bachelor of interdisciplinary studies, students must select three focus areas from the following subjects: business, criminal justice, sociology, writing, public administration, and music. Two of these focus areas require 18 credits, and a third focus area can count as an 18-credit concentration or a 15-credit minor. Students must complete 18 additional credits in courses that an advisor designates as relevant to the student's concentration. General requirements outside of these focus areas include global engagement courses and communication classes, and learners must complete a capstone course. Degree seekers must complete 26 focus credits, and 32 total credits, at Georgia Southern University, and at least 42 credits need to be drawn from upper-division courses. For graduation, the department requires a minimum 2.0 GPA as well as a 2.0 GPA in all focus areas. Students are eligible for financial aid, including the Georgia HERO Scholarship for veterans, current military members, and families of military personnel. Other scholarships common to Georgia Southern include the Cone Scholarship and the Out of State Fee Waiver Scholarship, which allows students to pay resident tuition for as many as four years. Georgia Southern University receives regional accreditation from the Commission on Southern Association of Colleges and Schools Commission on Colleges. Indiana University - Bloomington ranks #10 on The 45 Best Online Bachelor's in General Studies Programs! Indiana College at Bloomington opened to 10 students in 1824 and graduated its first class in 1830. Today, the flagship institution reaches more than 33,000 learners from over 140 nations. Indiana University, as a whole, has educated more than 650,000 students through over 500 programs. The school's bachelor of general studies calls for 120 credits, 69 of which must come from the arts and sciences. Only 21 credits, however, can come from a single department in the College of Arts and Sciences. Students also select an 18-hour concentration from the following subjects: arts and humanities, science and mathematics, or social and behavioral sciences. Degree seekers can also pursue as many as three minors along with university certificates. Learners must show competency in what the department calls fundamental skills. The areas in this category are written communication, quantitative reasoning, oral communication, computer literacy, and diversity, and degree candidates can fulfill these requirements through courses or tests, such as DANTES. A total of 30 credit hours must be earned at Indiana University, but 20 of those hours cannot be fulfilled through online courses. Should this on-campus component pose a problem, department-administered examinations can be taken in lieu of on-campus courses. Completion of this general studies online degree requires a 2.0 GPA and a minimum "C-" grade for all core classes. For admission, transfer students must possess a minimum GPA of 2.0 in prior college coursework. However, students with no college experience may apply, provided they are at least 21 years old and have graduated high school or earned a GED. Indiana University receives regional accreditation from the Higher Learning Commission. South Dakota State University ranks #11 on The 45 Best Online Bachelor's in General Studies Programs! Based in the small town of Brookings, South Dakota State University boasts a history that goes back to 1881 -- years before South Dakota became a state. Over 12,000 students study at this school and can choose from more than 180 fields. Students with an interest in multiple subjects can earn the 120-credit general studies degree online. Beyond required courses like written communication, mathematics, and a general studies seminar, students must select three areas of study and designate 15 credit hours toward each field. Concentration options include fine arts, engineering, allied health, business, and technology. Twenty of those focus area credits must come from upper-division classes. The department requires a capstone project to complete the program. To lower the number of courses needed to graduate, students may earn credit for life experiences or individual learning pursuits by taking exams, such as CLEP and DSST/DANTES. Degree candidates may also gain these credits by submitting a portfolio or, if no applicable exam exists, requesting the department create a relevant test. Online learners can stay linked to campus news through the Connections Newsletter. This document, delivered by email, alerts students to new programs, faculty spotlights, and university expansions. Additionally, SDSU offers online tutoring through SmartThinking for topics like business writing and resume building. Various are also available for students, including transfer scholarships and Native American scholarships. South Dakota State University receives regional accreditation from the Higher Learning Commission. Minot State University ranks #12 on The 45 Best Online Bachelor's in General Studies Programs! Minot State University in North Dakota educates more than 3,000 students, over 1,000 of whom attend classes online. These students come from nearly 30 countries to study over 60 undergraduate and graduate subjects through courses that, on average, include only 13 students. The 120-credit bachelor of general studies allows students to choose from over 200 online courses in areas such as communication, science, and wellness. Forty credits from those classes must be upper-division, and learners must complete one-fourth of coursework at Minot State University. Students may not claim any field as a concentration or a minor, but may personalize the degree plan to suit career goals and interests. . In addition to standard courses, learners can enroll in independent studies after planning the course with faculty and submitting a request form. The university, however, only allows four independent study classes per degree. Additionally, students can enroll in interactive video network classes. To graduate, students must earn a 2.0 GPA and submit a survey and essay. Online students obtain access to a number of virtual tools from the university such as the Ask Dr. Math feature. This tool responds to learners' questions through email. Additionally, CCP interactive modules provide tutorials in subjects such as economics and chemistry, and several tools that offer study tips are available. The university extends in-state tuition to all students, and financial aid is available to qualifying degree candidates through grants, loans, and scholarships. Available scholarships include the Great Plains Transfer Scholar Awards, the Distinctive and Engaged Scholars Award, and the Service for the Common Good Award. Scholarships specifically for military personnel and families also exist from sources like the Air Force Aid Society and the North Dakota Dollars for Scholars. Minot State University receives regional accreditation from the Higher Learning Commission. City University of Seattle ranks #13 on The 45 Best Online Bachelor's in General Studies Programs! The City University of Seattle began in 1973 under the name of City College. The name changed in 1982 to City University, but only in 2007 did the institution become the City University of Seattle. The school educates approximately 7,000 learners from at least three continents -- North America, Europe, and Asia -- through over 60 degree programs and certificates. Additionally, the university is linked to the National University System. Students seeking an on online general studies bachelor's degree can look to the institution's bachelor of science in general studies, which trains degree candidates to think critically and creatively in multiple fields. To earn the bachelor's, students must complete 180 quarter hours, which translates to 120 standard credit hours. Half of those credits go toward general coursework, like writing and electives. In addition to a capstone project, learners must select two 20-credit focus areas from possibilities like sociology, communication, accounting, project management, and human resources. Degree candidates can transfer as many as three-fourths of the total number of credits needed to graduate, and they gain job search assistance from the school's career center. Online students can take advantage of this tool in the online student portal to uncover tips in areas like resumes, networking, and interviews. Additionally, the school's library provides online research aids, like ebooks, articles, and citation rules. Financial aid includes the Enactus Scholarship, which rewards leadership traits, and the International Students Scholarship. Additionally, the school participates in the Yellow Ribbon program. This detail means the school and the Veterans Administration have an agreement to assist with military personnel's educational costs. Veterans and active military members also receive lower tuition. The City University of Seattle receives regional accreditation from the Northwest Commission on Colleges and Universities. Louisiana Tech University ranks #14 on The 45 Best Online Bachelor's in General Studies Programs! Based in the small city and parish seat of Ruston, Louisiana Tech University began in 1894 as the Industrial Institute and College of Louisiana. The school conferred its first degree in 1897 to a single recipient, and only 10 learners earned degrees in 1898. Currently, however, this public school boasts more than 12,000 students from over 60 countries. The school offers students a bachelor of general studies. For this 120-credit program, students fulfill basic requirements in subjects like English, mathematics, arts appreciation, and computer literacy, but also choose a 24-credit concentration that covers at least two fields in the humanities, social sciences, or business. For instance, a humanities concentration may include the fields of journalism and speech communication, while social science possibilities include anthropology and geography. Business students, by contrast, take required courses such as management, economics, and finance. For this online general studies degree, practicums do not qualify for credit, and a maximum of 27 credits may come from the business department. Students must also complete 51 elective credits. To graduate, students must hold a 2.5 GPA in the concentration and all upper-division courses, along with a 2.0 cumulative GPA. Scholarships available to students include a College of Liberal Arts Scholarship for those with a 3.0 GPA who submit letter explaining why they need financial assistance. Applicants for the scholarship must also submit tax information and a recommendation letter. Louisiana Tech University receives regional accreditation from the Southern Association of Colleges and Schools Commission on Colleges. Northwestern State University of Louisiana ranks #15 on The 45 Best Online Bachelor's in General Studies Programs! Founded in 1884, today Northwestern State University of Louisiana offers 40 programs in an online format. NSULA started Louisiana's first virtual campus, and the school's programs have been praised by organizations such as Military Advanced Education and the Lumina Foundation. The school's bachelor of general studies consists of 120 credits, some of which go toward a concentration chosen from three options: arts and communication, computer and natural science, and social science. Learners must earn 18 credits in all of these fields to fulfill general requirements, but allot an additional 18 credits toward the concentration area. Twelve of those 18 credits should come from upper-division courses. Degree candidates must complete a minimum 30 credits at NSUL. Learners should also maintain a "C" average in both the concentration area and in overall coursework. To cut down on the credits needed to graduate, students can earn credit for experiences outside of the classroom. This process, called the prior learning assessment, requires a class for building an experience-based portfolio. During this course, students analyze the previous experience in light of educational concepts like leadership, career goals, and philosophy. Many online courses at NSU utilize Moodle, which is learning software that assists in course delivery and planning. Other common learning tools include webinars, PowerPoint lessons, WebEx, and forums. Students who qualify for financial aid may attain university scholarships like the Outstanding Student Transfer Scholarship and the Bulldog Out-of-State Scholarship. Distance learners pay in-state tuition. Northwestern State University of Louisiana receives regional accreditation from the Southern Association of Colleges and Schools Commission on Colleges. Indiana University-Purdue University-Indianapolis ranks #16 on The 45 Best Online Bachelor's in General Studies Programs! Founded in Indianapolis in 1891, Indiana University-Purdue University-Indianapolis is an urban campus home to nearly 30,000 students. IUPUI offers several online programs, including an online bachelor's degree in general studies. IUPUI's online general studies degree appeals to adult students who have not completed a degree, transfer students looking for a broad-based degree program, and current IUPUI students who want an alternative degree completion path. Nearly all general studies students are 21 years old or older, and many have significant work and life experience, including previous college credits. General studies students complete a broad range of courses at IUPUI. In addition to 30 credit hours of core classes, majors take 18 credits in either arts and humanities, science and math, or social and behavioral science. They also take 51 credit hours in general electives, which can come from IUPUI's professional schools. In order to graduate, candidates must complete 120 credit hours, including either an internship or a capstone project. In order to gain admission to IUPUI's general studies program, applicants must have earned a high school diploma or GED, and cultivated significant work and life experience. Transfer students must hold a minimum GPA of 2.0 or have been out of college for more than one semester. The specific admissions process differs depending on whether students have ever been admitted to an Indiana University and how long they have been out of school. The program accepts a maximum of 90 transfer credits from four-year colleges and universities or a maximum of 64 credits from two-year and community colleges. Indiana University-Purdue University-Indianapolis receives regional accreditation from the Higher Learning Commission. University of Louisiana at Monroe ranks #17 on The 45 Best Online Bachelor's in General Studies Programs! The University of Louisiana at Monroe, part of the University of Louisiana system, dates back to 1931 and sits on the Bayou DeSiard river in the city of Monroe. ULM offers a flexible online bachelor's degree in general studies. ULM's general studies degree online provides customized coursework for students with a wide range of interests. Students take a variety of classes, making the degree suitable for several diverse entry-level occupations. ULM offers many of its online courses in eight-week sessions aligned with the semester schedule. In order to receive a bachelor's degree in general studies, students must complete 120 credit hours, including 40 credits of core courses. Students choose one of five thematic concentration groups -- arts and humanities, natural sciences and mathematics, social sciences, business, or applied science -- as a major concentration, which requires 30 credits. They also complete 30 credits in electives and 12 credits in a secondary concentration group. Transfer students may apply previously earned credits toward their degree. For admission, transfer students must provide official transcripts for previous college-level work and ACT or SAT scores. Beginning freshman can enroll in the program if they submit official high school transcripts with a minimum 2.35 GPA, along with ACT or SAT scores. First-time freshman who are over 25 can also apply with official high school transcripts or GED scores, and ACT or SAT scores. ULM encourages candidates who do not meet the program's minimum requirements to apply for a case-by-case review. The University of Louisiana at Monroe receives regional accreditation from the Southern Association of Colleges and Schools Commission on Colleges (SACSCOC). Hampton University ranks #18 on The 45 Best Online Bachelor's in General Studies Programs! Hampton University, which has offered classes in Hampton, Virginia since the 1860s, is one of the top historically black universities in the country. Hampton offers several online bachelor's degrees, including an online bachelor of arts degree in general studies. The online general studies bachelor's degree at Hampton provides a strong general education foundation in humanities, social sciences, and natural sciences. It also includes coursework in economics and business, preparing graduates for a range of careers. Military and civilian students who have prior college-level coursework can apply transfer credits toward the general studies degree. In order to earn a BA degree, students must complete 122 credit hours of coursework. Students are required to take courses in English, biology, communications, mathematics, history, philosophy, psychology, and other foundational liberal arts departments, as well as 12 credits in business. Learners can also take 30 credits of electives, and they must complete a general studies capstone course in order to graduate. Hampton requires applicants to provide an official high school transcript or GED, a completed application, an essay, and official transcripts for any college-level work. Transfer students must have a 2.0 GPA or better at their previous institution, and they can apply to transfer credits toward their Hampton degree. Military personnel may also present a military transcript to earn transfer credits. Hampton University receives regional accreditation from the Southern Association of Colleges and Schools Commission on Colleges (SACSCOC). University of Central Missouri ranks #19 on The 45 Best Online Bachelor's in General Studies Programs! The University of Central Missouri is a public university located in Warrensburg, Missouri. Since its founding in 1871, UCM has offered a range of degrees, and today the university offers several online bachelor's degrees, which has included a bachelor of arts and a bachelor of science degree in general studies since 2009. The general studies online degree from UCM appeals to students who have earned college credits without a degree or who require a bachelor's degree for career reasons but do not need a specific major. The general studies program helps students complete a degree by tailoring the courses to students' interests. In order to graduate, general studies majors must complete 120 credit hours of coursework, including 48 credits of general education program requirements. Graduates must meet UCM's degree requirements, which can be fulfilled with a number of courses. In order to earn a BA degree, students must demonstrate proficiency in a foreign language. UCM waives this requirement for the BS degree. Applicants must submit official transcripts for high school and any college-level work. If applicants have fewer than 24 credits at the college level, they must also submit ACT or SAT scores if they graduated high school within the past two years. The school does not require students who have completed more than 24 credits to provide a high school transcript or ACT or SAT scores. Transfer students must have a minimum 2.0 GPA in college-level work, and they can transfer up to 90 credits toward the UCM general studies degree. UCM charges the same online tuition rate for Missouri residents and non-residents. The University of Central Missouri receives regional accreditation from the Higher Learning Commission. Eastern Kentucky University ranks #20 on The 45 Best Online Bachelor's in General Studies Programs! Located in Richmond, Eastern Kentucky University has been conferring degrees in the heart of the Bluegrass since 1906. Today EKU offers several online bachelor's degrees, including a bachelor of science in general studies. EKU's online degree program in general studies allows students to apply previously earned credits toward a bachelor's degree. The program is flexible so that students and allows learners to customize a degree program to their unique educational and career goals. EKU graduates pursue a range of jobs with a general studies degree, including in business, education, healthcare, and real estate. Once admitted to EKU's general studies program, students must complete 120 credit hours in order to graduate. EKU allows students to transfer up to 90 credits toward the general studies degree, while a minimum of 30 credit hours must be completed at EKU. Students create a personalized graduation plan and complete online courses on an eight-week term. Transfer students with more than 80 credits from previous institutions qualify for Project Graduate, EKU's fast track option to earn a bachelor's degree. In order to apply for admission at EKU, applicants must complete the application form and submit official transcripts for all previously attended colleges and universities. Applicants with fewer than 24 credits at the college level must also submit official high school transcripts and ACT or SAT scores. EKU offers flexible start dates (with up to six different start dates during the year). EKU charges the same online tuition rate for Kentucky residents and non-residents. Eastern Kentucky University receives regional accreditation from the Southern Association of Colleges and Schools Commission on Colleges (SACSCOC). North Greenville University ranks among The 45 Best Online Bachelor's in General Studies Programs! North Greenville University is a private Christian university located in Tigerville, South Carolina at the foothills of the Blue Ridge Mountains. Since 1891, NGU has offered a number of degree options, including an online bachelor of arts in general studies. The online general studies program at NGU provides flexibility in course selection so that students can personalize their degrees. Majors pursue classes from a range of disciplines and complete a senior research project, a service project, or a portfolio. The general studies degree prepares graduates for any entry-level jobs, including business, sales, or administrative positions. NGU requires students enrolled in the school's general studies degree to complete 120 credit hours of coursework. In addition to core courses in philosophy, world history, natural science, and fine arts, students can choose electives from the liberal arts course offerings. General education courses include religion, composition, American history, and mathematics. Students can also complete up to two minors within general studies by completing 18 credit hours for each minor in specific fields. NGU's online programs only enroll adult learners 22 years old or older. Applicants with no prior college experience must submit an application and official high school transcripts, while applicants who have completed some college-level coursework must submit an application and official high school transcripts plus official college transcripts. Graduates must earn a minimum of 25% of the credits applied toward the degree from NGU. NGU is affiliated with the South Carolina Baptist Convention. North Greenville University receives regional accreditation from the Southern Association of Colleges and Schools Commission on Colleges (SACSCOC). Saint Louis University ranks among The 45 Best Online Bachelor's in General Studies Programs! Founded in 1818, Saint Louis University is the oldest institution of higher education west of the Mississippi River, as well as one of the oldest Catholic universities in the country. Located in Saint Louis, SLU offers a range of online bachelor's degrees, including a bachelor of arts in general studies. The SLU online general studies degree, offered through the School for Professional Studies, prepares graduates for jobs in multiple industries. The flexible program offers a broad base of knowledge and appeals particularly to working adults. SLU's general studies degree allows graduates to pursue their future career and academic goals. In order to graduate from SLU with a BA in general studies, students must complete 120 credit hours of coursework drawn from a range of liberal arts courses. In addition to courses in history, literature, philosophy or theology, science or technology, majors complete 15 credit hours in courses at any level in any discipline. Students must earn 24 credits at the 3000 and 4000 level, and they can choose to take between 27 and 39 credits of electives. Majors can select an optional 12 credit concentration and must complete a capstone course prior to graduation. Applicants to SLU's School for Professional Studies must be at least 22 years old, though younger students may be admitted on a case-by-case basis. Prospective students should submit evidence of a high school diploma or GED, and have at least three years of work experience or the equivalent. Most degree seekers transfer credits from previous institutions. SLU allows students to transfer up to 64 credits from community colleges and up to 90 credits from four-year accredited institutions. Saint Louis University receives regional accreditation from the Higher Learning Commission. Arkansas State University ranks among The 45 Best Online Bachelor's in General Studies Programs! Located in Jonesboro, Arkansas State University is a public institution founded in 1909. Beginning its existence as an agricultural school, today A-State has grown to become the second-largest university in Arkansas. A-State's main campus offers several online bachelor's degree programs, including an online bachelor of general studies. A-State's degree in general studies provides a flexible pathway to graduation for students with prior coursework or professional experience. Students customize their coursework around their future career or academic goals. A-State's general studies program emphasis areas — which allow students to concentrate in fields including industrial management, criminology, health, and childhood education — provide clear career paths toward general studies degree jobs. Majors in general studies at A-State must complete 120 credit hours in order to graduate. The required coursework includes classes in humanities, mathematics, social sciences, life sciences, and physical sciences. Majors then choose an emphasis area with additional required coursework designed to prepare students for specific professional positions. Most A-State courses operate on a seven-week term. In order to enroll in the A-State general studies program, prospective students must complete an online application and submit official transcripts from all previously attended colleges and universities. A-State allows incoming students to transfer up to 90 credits of coursework completed at other accredited institutions of higher learning. A-State charges the same online tuition rate for Arkansas residents and non-residents. Arkansas State University receives regional accreditation from the Higher Learning Commission. Lindenwood University ranks among The 45 Best Online Bachelor's in General Studies Programs! Founded in 1827 as a women's college, today Lindenwood University is a private, co-educational university located in St. Charles, Missouri, just west of St. Louis. Lindenwood offers several bachelor's degrees online, including the school's bachelor of arts degree in interdisciplinary studies. Lindenwood's online general studies program fosters core cross-disciplinary skills that prepare graduates for multiple jobs with a general studies degree. The online option offers students working part-time or full-time flexibility in earning a degree and allows students to specialize in three concentration areas. In order to earn a bachelor's degree from Lindenwood, students must complete 128 credit hours of coursework. The interdisciplinary studies degree requires majors to complete 42 credit hours of general education courses, which the school requires of all undergraduates. Interdisciplinary studies majors then choose three concentrations and take nine credit hours in each of those three program areas at Lindenwood. The concentrations allow students to demonstrate superior skills in self-selected fields. Applicants for Lindenwood's BA in interdisciplinary studies must complete an application, submit official high school transcripts or a GED certificate, and provide results from the ACT or SAT. Transfer students who have completed at least 24 credits at the college level or adult learners who graduated from high school more than five years ago do not have to provide ACT or SAT scores. Lindenwood limits the number of transfer credits incoming students can apply toward the degree; graduates must complete at least 50% of their BA credit hours at Lindenwood. Lindenwood University receives regional accreditation from the Higher Learning Commission. Drury University ranks among The 45 Best Online Bachelor's in General Studies Programs! Located in Springfield, Missouri, Drury University is a private liberal arts college with a strong College of Continuing and Professional Studies, which runs Drury's online education programs. Drury offers an online bachelor of science degree in general studies. Drury's general studies program online offers students flexibility in creating a degree that fits their individual needs. To receive a Bachelor in General Studies, you must complete a minimum of 30 credit hours at Drury with a 2.0 GPA, as well as a senior seminar; 18 of these credit hours must be upper-level. Drury is an excellent option for students who hold a technical associate degree but must earn a bachelor's degree for career advancement. In addition to the technical degree transfer program, Drury also offers an individual program for students in the general studies program. Working with an academic advisor, majors design an individualized program of study in one of six areas: humanities and fine arts, science and mathematics, social sciences, sustainability, organizational leadership, or conflict resolution and peacebuilding. In order to graduate, students must complete 124 credit hours, including Drury's core requirements and 30 credit hours in the learner's focus area. Students can transfer credits earned at other universities, but they must earn their final 30 credit hours at Drury. Applicants to Drury's College of Continuing and Professional Studies must complete an application and submit official high school and college transcripts. Students who hold an associate of arts degree from a regionally accredited institution can enter Drury with junior year status and will be automatically awarded 42 semester hours of general education coursework. Drury University receives regional accreditation from the Higher Learning Commission. Dakota State University ranks among The 45 Best Online Bachelor's in General Studies Programs! Originally founded in 1881 as a school for teacher education in the Dakota territory, today Dakota State University is a public university located in Madison, South Dakota. DSU offers several online bachelor's degrees, including an online bachelor's degree in general studies. DSU's general studies program online allows students to build their own customized degree program tailored to fit individual needs. The general studies option allows transfer students who have earned college credits in several fields complete a bachelor's degree. DSU integrates technology into all of their degree programs, which prepares graduates for a range of general study jobs after graduation. At DSU, majors in general studies must complete 120 credit hours in order to graduate. In addition to completing DSU's general education requirements, majors take 15 credits each from three different emphasis areas, including health, business, education, social science, and technology. The emphasis areas allow students to customize their plans of study and demonstrate proficiency in several career areas. In order to enroll in DSU's general studies program, applicants must submit official high school transcripts or a GED certificate. Transfer students with more than 24 credit hours at the college level can apply to DSU by submitting official college transcript with a cumulative 2.0 GPA or higher. Once admitted, students can transfer up to half of the credits required for the degree, and must complete a minimum of half of their credits at DSU. DSU charges the same online tuition rate for South Dakota residents and non-residents. Dakota State University receives regional accreditation from the Higher Learning Commission. McNeese State University ranks among The 45 Best Online Bachelor's in General Studies Programs! McNeese State University, a member of the University of Louisiana system, is a public university located in the city of Lake Charles. Founded in 1939, today McNeese offers several online degrees, including an online bachelor's degree in general and basic studies. At McNeese, undeclared students enroll in basic studies until they select a major. Students with a broad range of interests, or with significant college-level work at another institution, can declare a general studies major. The program fosters broad and interdisciplinary skills through an individualized course of study. The general studies program online requires majors to complete 120 credit hours of coursework, including 39 credits of general education courses. Once students declare a general studies major, they choose one of three concentrations: applied and natural sciences, arts and humanities, or behavioral sciences. Majors complete 37 credit hours within the concentration and 44 credits of electives. In order to graduate, general studies students complete a capstone course. McNeese applicants must complete an application and submit official high school transcripts and ACT or SAT scores. Transfer students must also submit official college transcripts, and the school waives its ACT or SAT requirement for students who have completed 18 credit hours or more at the college level. Students can transfer up to 90 credits toward the degree. The final 30 credit hours must be completed at McNeese. McNeese charges resident tuition fees for all online coursework, regardless of whether students are Louisiana residents. McNeese State University receives regional accreditation from the Southern Association of Colleges and Schools Commission on Colleges (SACSCOC). Southern New Hampshire University ranks among The 45 Best Online Bachelor's in General Studies Programs! Located on the Merrimack River in Manchester, Southern New Hampshire University is a private, nonprofit university that offers over 200 online degree programs. SNHU's online bachelor of arts degree in general studies allows students with previous college-level work to earn a bachelor's degree. SNHU's general studies degree online allows students to maximize credits they have already earned to complete a bachelor's degree. General studies majors concentrate in career-focused fields such as accounting, business, communication, psychology, and more. These concentrations customize the program for general studies jobs on a range of career paths. General studies majors at SNHU complete 120 credit hours in order to graduate. Students complete SNHU's general education program, which includes 45 credit hours in foundational courses, exploration courses, and integration courses. Majors declare an approved concentration and complete four courses within the concentration. SNHU's flexible program also allows 60 credits of electives, and SNHU offers online courses in six terms each year. In order to enroll at SNHU, applicants must fill out an online undergraduate application. SNHU will retrieve transcripts from any previous institutions located in the U.S., and automatically evaluate the transcript for transfer credits. SNHU does not charge an application fee, and incoming students may transfer up to 90 credits toward a bachelor's degree. SNHU offers a 30% tuition discount to U.S. service members and the spouses of those on active duty. Southern New Hampshire University receives regional accreditation from the New England Association of Schools and Colleges (NEASC). University of the Incarnate Word ranks among The 45 Best Online Bachelor's in General Studies Programs! Located in San Antonio, Texas, the University of the Incarnate Word is a private Catholic university. UIW's School of Applied Sciences allows adult learners to earn bachelor's degrees, including an online bachelor of science degree in health sciences in general studies. Unlike other online general studies degrees, UIW's program specializes in health sciences. The School of Applied Sciences accepts adult learners who have been out of high school for at least five years. Applicants with a background in the military can apply their previous work toward the general studies online degree. The health sciences general studies degree prepares graduates for careers in the healthcare field, including as benefits managers, clinical managers, or community service managers. In order to graduate, degree candidates must complete 120 credit hours of coursework, including 42 to 46 credits of UIW core curriculum requirements. Majors then complete 33 hours of health sciences core curriculum classes, including legal issues in healthcare, public health, healthcare policy, and health sciences research. Students also take 21 hours of general studies coursework and electives. All graduates complete a capstone course in health sciences. UIW offers courses on an eight-week term. Applicants to the UIW School of Applied Sciences must submit official transcripts for all college-level work and should have a cumulative 2.5 GPA or higher. UIW admissions requires that adult learners graduated from high school at minimum five years ago and have completed three years of full-time employment, including in the home. Transfer applicants can transfer up to 75 credits, and must complete at least 45 credits at UIW. University of the Incarnate Word receives regional accreditation from the Southern Association of Colleges and Schools Commission on Colleges (SACSCOC). University of South Dakota ranks among The 45 Best Online Bachelor's in General Studies Programs! The University of South Dakota, located on the bluffs above the Missouri River in Vermillion, is the state's flagship public university. USD offers over 40 online programs, including an online bachelor's degree in general studies. The online general studies degree at USD accepts students who have accumulated significant college credit and want to complete a bachelor's degree. Incoming students must have 60 credit hours minimum to enroll, and they can transfer as many as 90 credits. The program, which allows students to craft their degree plans around three concentration areas, provides students with a flexible path to a degree. General studies majors at USD complete 120 credit hours in order to graduate, including the university's 30 credits of general education requirements. Students choose from three areas of emphasis and take 15 credits in each area, including health, business, education, fine arts, social sciences, and technology. In order to graduate, majors in general studies also complete a capstone course. USD offers classes on the semester schedule. Applicants to USD's general studies program should complete an application and submit official college transcripts for all previous higher education institutions. Former students of USD or other South Dakota Board of Regents universities need not submit transcripts. Admitted students can also complete courses at one of USD's four locations across South Dakota (Vermillion, Sioux Falls, Rapid City, and Pierre). USD charges the same online tuition rate for South Dakota residents and non-residents. The University of South Dakota receives regional accreditation from the Higher Learning Commission. Northern State University ranks among The 45 Best Online Bachelor's in General Studies Programs! Founded in 1901 in Aberdeen, South Dakota, NSU enrolls more than 3,600 students in its online and on-campus programs and boasts a 20-to-1 student-to-teacher ratio. NSU's bachelor's of general studies allows students to design their own program and train for a variety of occupations. Students must maintain a 2.0 GPA during the 120-credit program. The curriculum includes a three-credit capstone course, and students complete special projects under the supervision of experienced faculty members. The online general studies program prepares students for careers in the fine arts, business, education, and technology. NSU assigns each student an advisor for the first two years, after which students receive counseling from an advisor in their major. More than 90% of online students receive financial assistance, and NSU offers a merit-based scholarship for students who meet certain academic requirements. Northern State University maintains regional accreditation by the Higher Learning Commission as well as by the South Dakota Department of Education. Sam Houston State University ranks among The 45 Best Online Bachelor's in General Studies Programs! Established in 1879, SHSU is the third-oldest public institution of higher learning in Texas. SHSU has offered online bachelor's programs since 2009, and the university archives all class materials. Students in SHSU's online bachelor's of general studies program must declare a major before beginning coursework and must maintain a 2.0 GPA. This interdisciplinary online general studies degree requires 120 credit hours, including 42 hours of coursework in the Texas core curriculum. Students complete 54 hours in three academic minors, 15 hours of elective courses, and a three-hour general studies capstone course. Minors available online include business education, criminal justice, political science, and art history. Admitted students meet with an academic advisor for a mandatory information session prior to beginning the program. Online students pay a distance learning fee. SHSU receives accreditation by the Southern Association of Colleges and Schools Commission. The college of education is also accredited by the National Council for Accreditation of Teacher Education and is one of only thirteen schools in Texas to receive this standard. Trevecca Nazarene University ranks among The 45 Best Online Bachelor's in General Studies Programs! Trevecca is a private, Christian college located in Nashville, Tennessee. Established in 1901, Trevecca is one of eight liberal arts colleges in the U.S. affiliated with the Church of Nazarene. The university offers an online bachelor's of arts in general studies program that prepares students for careers in areas including healthcare administration, psychology, Christian ministry, and information technology. Trevecca's general general studies program requires 120 semester hours. The curriculum includes 36 general education hours, 54 elective hours, six hours of religion courses, and a three-hour capstone course. Students dedicate 21 hours to an upper-level discipline. Students learn to articulate biblical themes, practice various modes of thinking, and understand the parameters of Wesleyan-Holiness tradition. Online courses are delivered asynchronously through Blackboard, so students can complete coursework at their convenience. The general studies online degree follows a cohort model; students work through the program in small groups. The university participates in the Yellow Ribbon Program to support military students, and transfer students may apply up to 90 previous hours toward the degree. TNU maintains regional accreditation from the Commission on Colleges of the Southern Association of Colleges and Schools. Indiana University East ranks among The 45 Best Online Bachelor's in General Studies Programs! Founded in Richmond in 1971, IU East is part of the Indiana University system. IU East offers online programs designed for working professionals, including an online bachelor's of general studies. Students completing the general studies program online take courses from various academic disciplines. The program requires 120 credit hours, and students can concentrate in arts and humanities, natural science and mathematics, or behavioral and social science. Students must maintain a 2.0 GPA, and new students with fewer than 12 transferrable hours must complete a first-year seminar. For graduates with a bachelor's in general studies, jobs across industries are available. Online students have access to IU East's extensive library and resource centers for math, science, and writing. Online students are eligible for federal grants and loans. IU East continues to receive regional accreditation by the Higher Learning Commission of the North Central Association of Colleges and Schools. The school's next comprehensive accreditation review will take place between 2021 and 2022. Medaille College ranks among The 45 Best Online Bachelor's in General Studies Programs! Medaille is a private, liberal arts institution in Buffalo, New York. Established in 1937, the school bases its curricula on foundations in the liberal arts and sciences. Medaille's small class sizes create opportunities for individualized instruction. Medaille offers an online BS in general studies that is ideal for working professionals with previous college experience. Students earning the general studies degree online benefit from flexible scheduling. The asynchronous courses include no assignment deadlines, and students can complete one to four courses per semester. The 120-credit program includes 60 core credits. For graduates with a bachelor's in general studies degree, jobs include positions in education, social sciences, and technology. Medaille offers rolling admissions and accepts students until classes are full. Students can complete the program in two and a half years or less, depending on transfer credit, number of courses taken per term, and prior learning credit. Medaille College receives regional accreditation by the Middle States Commission on Higher Education. Southeast Missouri State University ranks among The 45 Best Online Bachelor's in General Studies Programs! Established in 1873 in Cape Girardeau, Southeast is one of the largest educational institutions in the state. The university offers an online general studies bachelor's degree that requires 120 semester hours, which full-time students complete in four years. Online students can participate in study abroad programs, research internships, and student teaching. The curriculum includes 42 hours of general education coursework in areas such as written expression, behavioral systems, and English composition. Students complete a first-year seminar course and 39 hours in 300- to 500-level courses. During their junior year, students must pass a writing proficiency test. Internships are available, and graduates pursue careers in diverse areas including marketing assistance, screen printing, graphics managing, and programming. Applicants should have a high school diploma with a minimum 2.0 GPA, an HSE diploma with a Missouri HiSET score of 15 or better on each subsection, or a GED score of at least 2500. Students who do not meet these requirements are restricted to part-time enrollment during their first semester. The university maintains regional accreditation by the Higher Learning Commission. Columbia College ranks among The 45 Best Online Bachelor's in General Studies Programs! Originally founded as the Christian Female College in 1851, CC is a private, nonprofit institution. The liberal arts and sciences school began admitting men in 1970. CC offers an online bachelor's of general studies degree tailored to students for whom an appropriate major is not available. This 120-hour program requires a three-hour ethics course and 41 semester hours of general education, including coursework in Western civilization, human biology, the sociology of gender, and art appreciation. Students who transfer fewer than 36 previous semester hours must complete 23 to 26 hours of introductory studies. Students who have not studied abroad or lived six continuous months outside the United States must complete a three-hour multicultural course. Graduates pursue careers in management, business, and education. CC delivers online courses synchronously. Columbia College continues to receive regional accreditation by the Higher Learning Commission and has done so since 1918. The colleges next HLC reaffirmation takes place in 2022 to 2023. Wichita State University ranks among The 45 Best Online Bachelor's in General Studies Programs! Founded in 1895, WSU is one of three public research institutions in Kansas. Students in WSU's online bachelor's of general studies program select pre-structured majors from options including women's studies, criminal justice, anthropology, political science, and aging studies. Students complete 120 credit hours, at least 94 of which must be in the liberal arts and sciences. Students complete 12 credit hours in upper-level courses. The program does not include foreign language requirements. Graduates often pursue careers in communication, education, and government. WSU accepts applications on a rolling basis and admits students until classes are filled. Online students work with an academic advisor to develop a plan of study. The same professors teach online programs and their on-campus counterparts. WSU delivers online coursework synchronously, and the university accepts transfer credit from regionally accredited institutions. WSU maintains accreditation by the Higher Learning Commission of the North Central Association of Colleges and Schools. National University ranks among The 45 Best Online Bachelor's in General Studies Programs! Located in La Jolla, California, NU is the second-largest private, nonprofit school in the state. Founded in 1971, the university offers more than 35 online programs and 300 online courses. NU offers a bachelor's of arts in general studies as a hybrid program. Of the 180 required quarter units, students must complete at least 45 in residency at NU. Students completing the general studies program online explore a variety of disciplines. The curriculum integrates the arts and sciences with topics including computer science, leadership, and business law. The program requires upper-division electives, coursework in a chosen depth area, general studies courses, and a capstone course. Depth area requirements include 45 quarter units in an arts and sciences focus. Graduates pursuing jobs with general studies degrees often secure positions in technology, communications, and government. NU is a Yellow Ribbon school and provides services and discounts to active and retired military personnel. National University has maintained accreditation by the Commission for Senior Colleges and Universities of the Western Association of Schools and Colleges since 1977. Western Illinois University ranks among The 45 Best Online Bachelor's in General Studies Programs! Founded in Macomb in 1899, WIU is a public institution with a 14-to-1 student-to-teacher ratio. A 2018 U.S. News & World Report ranking lists WIU among the top 100 schools in the regional midwest. WIU offers a fully online bachelor's of arts in general studies with no time constraints for graduation. The university's online general studies degree is a non-majored program that requires 120 semester hours, including 40 hours of upper-division courses. The program also offers optional majors students can complete entirely online. WIU's online general studies degree prepares students for careers in business, industrial, and human services organizations. Students must complete at least 30 hours through WIU. Online students pay in-state tuition rates, regardless of residency. WIU supports active and retired military personnel by waiving the application fee, awarding credit for military training, and providing access to a veterans resource center. Western Illinois University receives accreditation by the Higher Learning Commission-North Central Association of Colleges and Schools. West Texas A&M University ranks among The 45 Best Online Bachelor's in General Studies Programs! Based in Canyon, WTAMU was one of seven original state-funded teacher institutions in Texas. A 2018 U.S. News & World Report ranking lists WTAMU as the 30th best public school in the nation. WTAMU offers a bachelor's of general studies degree in a hybrid format. The curriculum requires 120 credit hours, including at least 78 hours of electives and 39 hours of advanced courses; some advanced courses are available online. The program does not allow minors, but students focus on a chosen academic discipline. Students in the online general studies bachelor's program must maintain a 2.0 GPA. WTAMU delivers online courses synchronously on a semester schedule. WTAMU accepts applications on a rolling basis and admits students until classes are full. Graduates often pursue careers in social services, government and state programs, business management, and technology and programming. WTAMU maintains accreditation through the Southern Association of Colleges and Schools Commission on Colleges. Southern Utah University ranks among The 45 Best Online Bachelor's in General Studies Programs! Established in 1897 in Cedar City, SUU maintains educational partnerships with the National Parks Service and offers on-campus and online programs. SUU's programs incorporate a service learning experience, during which students organize and participate in community-based projects. SUU's bachelor's of arts and sciences in general studies is a multidisciplinary degree that requires 120 credits. The curriculum's general studies core includes a three-credit capstone course and a three-credit research seminar. The program requires 16 foreign language credits, which students may earn through testing. Online students have access to the career center and services including resume preparation, graduate school assistance, and networking opportunities. Students earning the general studies online degree work with an advisor to create a plan of study, which must be approved by the advisor and the dean. Students must complete at least 30 credits through SUU. Southern Utah University receives accreditation by the Northwest Commission on Colleges and Universities. Indiana University-Purdue University-Fort Wayne ranks among The 45 Best Online Bachelor's in General Studies Programs! Based on a cooperatively managed campus, IPFW is a public institution founded in 1964. The university is the largest educational institution in Northern Indiana. Nearly half of IPFW students are first-generation students, and 15% are from underrepresented populations. The university's bachelor's of general studies program requires 120 credit hours. Students must maintain a 2.0 GPA and can pursue three areas of learning, such as arts and humanities, social and behavioral sciences, and mathematics and general sciences. Students can customize the program to fit their interests; available courses include Afro-American studies, film, theater, and folklore. Students completing the online general studies program must earn at least 32 credit hours through IPFW and may dedicate no more than 21 hours to a single department or subject. Transfer students can apply up to 88 previous credit hours toward the degree, and IPFW awards credit for work experience, certifications, and licenses. Graduates often pursue careers in social service, industry, law, and government. IPFW maintains accreditation by the Higher Learning Commission. Lamar University ranks among The 45 Best Online Bachelor's in General Studies Programs! LU is a public research university located in Beaumont, Texas. Founded in 1923, LU supplements its programs with hands-on learning experiences. LU's online programs offer small class sizes so students receive individual attention from faculty and advisors. LU offers a bachelor's of general studies program in a synchronous format with 15-week terms and in an accelerated format with eight-week terms. The 120-hour program requires 42 hours of general education courses. Advances coursework comprises lifelong learning courses, a senior seminar, and an upper-level English course. Students complete 36 hours of advanced electives during their junior and senior years. After earning the general studies degree online, graduates often pursue careers in education, social services, and technology. LU delivers online coursework through Blackboard. Students must maintain a 2.0 GPA, and applicants must meet minimum standardized test scores. Lamar University continues to receive accreditation by the Southern Association of Colleges and Schools Commission on Colleges. Kentucky Wesleyan College ranks among The 45 Best Online Bachelor's in General Studies Programs! Established in Owensboro in 1858, Wesleyan is a private, liberal arts college affiliated with the United Methodist Church. More than 88% of faculty hold Ph.Ds, and small class sizes allow instructors to offer personalized attention to each student. Wesleyan's bachelor's of science in general studies program covers core general education fundamentals such as behavioral studies, humanities, social sciences, and English. Students complete 120 semester hours and a three-credit capstone course approved by an academic advisor. The curriculum includes 39 hours of general education requirements, at least 42 hours of upper-level courses, and a multicultural studies course. Students gain skills in communication, critical thinking, and global awareness. After completing the online general studies program, graduates pursue careers in government, management, and public relations. Students must complete at least 30 hours through Wesleyan and must maintain a 2.0 GPA. Kentucky Wesleyan College maintains accreditation by the Southern Association of Colleges and Schools Commission on Colleges. An online general studies bachelor's degree is one of the most flexible degree options available. Most programs allow students to customize their degree to fit their prior academic experience and professional aspirations. Typically consisting of 120 credits, an online general studies curriculum includes general education requirements and coursework in areas such as research methods, public speaking, and professional writing. Students may also complete coursework in anthropology, psychology, liberal arts, and political science. Students who earn their online general studies degree can pursue diverse career paths in areas such as customer service, education, and marketing. Students currently employed in their field of choice or those with a specific career in mind can complete electives that enhance their marketability in a desired area. Many programs feature interdisciplinary courses with topics in practical philosophy, technology's impact on society, and strategies for professional success. With numerous concentrations available, students may hone their skills in areas such as child development, health promotion, or human services. Most general studies degrees do not require a thesis, allowing students to focus on the development of skills applicable to their current profession. A unique feature of an online general studies bachelor's degree is its versatility. Students gain a broad general foundation in areas including business administration, early childhood education, and sales management. Below are a few potential careers for students who complete their general studies degree online. Administrative Services Manager: Administrative services managers conduct managerial tasks, including supervising administrative assistants, overseeing organizational records, and ensuring adherence to federal policy. Earning a bachelor's degree allows entry-level administrative services managers to advance into roles of greater responsibility with higher earnings. Preschool Teacher: Preschool teachers provide children ages five and younger with a structured environment that promotes healthy socialization and interactive learning. Preschool teachers create developmentally-appropriate lesson plans that emphasize learning through play. They implement schedules and classroom order. Earning a bachelor's degree increases a preschool teacher's chances of being employed in a public school. Sales Manager: A sales manager's duties include setting company goals, training sales representatives, and addressing customer concerns. Often required to work evenings and weekends, sale managers collaborate with other departments within an organization, including marketing and research. A bachelor's degree provides sales managers with knowledge of data analysis, which plays an increasingly important role in sales.